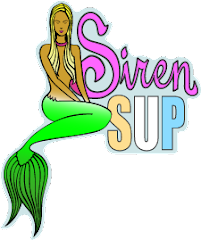 Kristy's Awesome Surf Adventures: SUP - My Newest Passion! SUP - My Newest Passion! For those of you who have not tried it, you need to! I am talking about Stand Up Paddling or SUP for short. It is my newest obsession and after surfing for 10 years I can honestly say it is also the best cross training for surfing I have done, and the most fun! SUPing is done on an oversized longboard, the size of the board is determined by the riders height and weight. Then there is the paddle, it is basically a longer version of an outrigger canoe paddle. The height of the paddle is determined by the height of the paddler plus about 8 inches. SUPing can be done anywhere from lakes and rivers to the ocean. It is just as fun paddling alone or with a group of friends. During a recent trip visiting my home state of Florida, SUPing enabled me to stay in surf shape even during a couple week flat spell! So if you cannot get to the beach, it's been flat for weeks or you just don't feel like battling the crowds try SUPing. It is a ton of fun, a great core workout and a great way to cross train for your next surf trip.